In September we organised a tea party not only to welcome the new children and parents to our Nursery but also to take part in the annual fundraising for Macmillan. 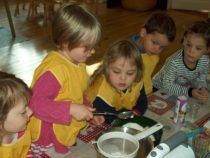 We baked cakes with the children in Nursery and asked parents to bake too. 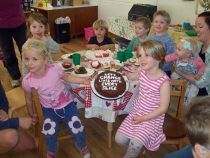 The result was that we raised the best part of £100, enjoyed vast quantities of delicious cake and had lots of fun doing it. The star of the show was the biggest and most delicious chocolate cake I have ever tasted, made by Lisa, Chloe’s mum and sold to the highest bidder on the day. Fortunately, the buyer was generous enough to share some with us, which is how I know it was delicious! 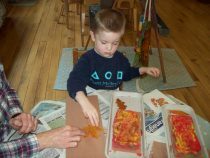 As the Autumn leaves began to fall, we gathered a variety of oak, sycamore and beech from our garden and used them to make some beautiful leaf prints. 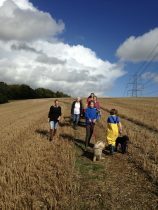 For harvest, we made soup and bread rolls and the children enjoyed kneading dough and cutting up leeks and potatoes. 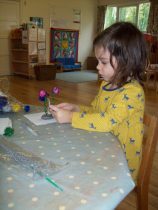 The firework models the children made in November were very effective – pipe cleaners and sparkly pompoms stuck in a lump of clay! 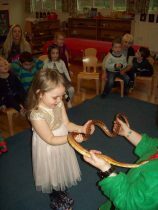 In December, we invited Zoolab to bring some of their animals to our Christmas party and many of the children enjoyed touching and stroking some of the animals including a rat, millepede, snaked and snail. We all learnt some interesting facts about their habitats and diet. Jane Rothery from the Horticultural Society has given us daffodil bulbs and each of the children has planted one in a pot which they will decorate. We are currently nurturing them ready to show in the Spring Show at Privett Village Hall in April when we look forward to seeing them on display. 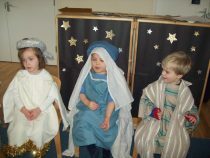 For our Christmas Nativity the children learned songs written by Brian Beresford and they sang them with great enthusiasm to their parents on the last day of term. It was lovely and at times very funny too so there were plenty of tears and laughter – just how it should be. 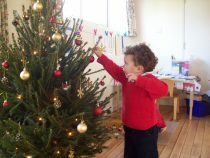 The village hall looked particularly festive this year with all the beams adorned with holly, ivy and fir and our Christmas tree was especially admired by some of the youngest members of the group. We look forward to seeing everyone in 2017 for the start of term on Thursday 5th January.